One of the first things we’ll do once we finally purchase our homestead is put in a large herbal garden with loads of both culinary and medicinal herbs for me to have at my fingertips. I have a few potted herbs now that can be moved easily, but it isn’t the same. Thankfully I have my collection of dried herbs available to use. They are so handy and convenient, and I keep all my mason jars lined up and ready to put into action at a moment’s notice. Peppermint Leaf is one of my favorite herbs to use in so many different applications throughout life and home. The scent is typically loved by all ages, and the herb is calming and soothing to the body. Here are nine ways that I love to use Peppermint. 1. Add a little cooling tea to your shampoo regimen. Add 1 teaspoon each of dried Peppermint, Horsetail, and Nettle Leaf to 8 ounces freshly boiled water and let steep for 1 hour. Use to rinse hair to stimulate scalp and encourage hair growth. You can use this recipe to make a bigger batch, if needed; simply store the extra in the refrigerator and use up within three days. 2. Add dried Peppermint Leaf to sugar scrubs to add texture and a delightful aroma. 3. A cup of peppermint tea can help to soothe an upset stomach or a feeling of having overeaten. 4. Make a peppermint-infused oil to gently massage the stomach and back and relieve an icky stomach from the outside in. Add peppermint leaf to a jar and cover with oil. Shake well and leave in a window. Shake every 12 hours. In the summer, you can strain after 2 days of steeping, but in the cold days of winter you might need to allow to sit for a full month to get a potent infusion. Strain and store infused oil in a glass jar for up to 3 months. 5. Put dried Peppermint Leaf in small fabric bags, tie with a ribbon, and place the sachets in drawers, closets and cabinets to discourage bugs and pests. You can also sprinkle the leaves straight into your cabinets and on window sills. 6. Try some Nighttime Peace Tea the next time you have trouble settling into bed. 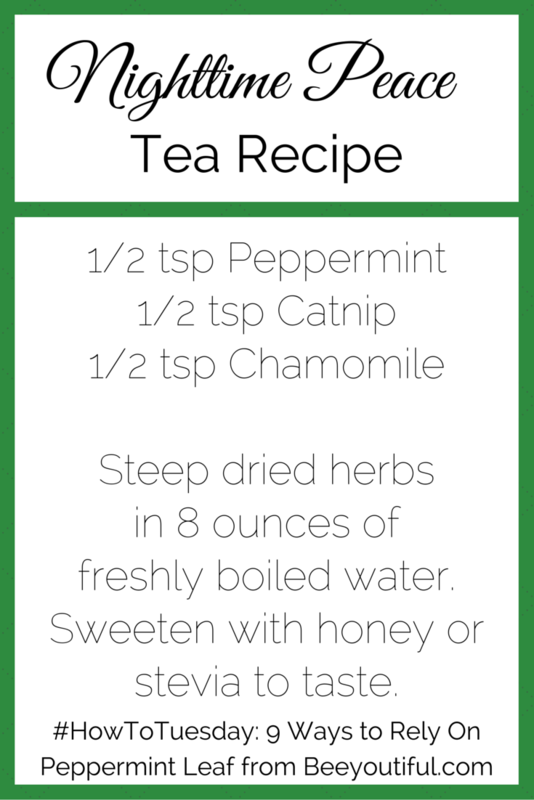 Use 1/2 teaspoon each of dried Peppermint, Catnip, and Chamomile. Steep in 8 ounces of freshly boiled water. Sweeten with honey or stevia to taste. 7. Using a base of unscented lotion, add ten drops of Peppermint Leaf Tincture and mix thoroughly. Then massage on sore muscles and joints. This makes a wonderfully cooling and soothing massage cream! 8. Make your own Peppermint Leaf Extract to use in cooking or as a tincture. Add peppermint leaf to a mason jar and fill the jar to cover the herbs with vodka. Use a ratio of 1:4 if using dried herbs, so 1/4 cup dried peppermint to 1 cup of vodka; for fresh herbs, use 1:2, so 1/2 cup fresh peppermint to 1 cup vodka. If using fresh peppermint, strain after one month; with dried peppermint, allow to steep for four months. This extract can be used to flavor coffee and teas or in baking, or take a few drops to help relieve digestive complaints. 9. I am in love with using a Peppermint Poultice as minty warm relief for congestion and headaches! Place several teaspoons of peppermint leaf in a bowl. Add enough freshly boiled water to thoroughly dampen the herbs. Mix well with either a pestle or a fork until incorporated. Place the moist herbs on a clean, dry cotton cloth and fold into a small packet. When cooled enough to apply to the skin, place on the chest for congestion or on forehead or back of the neck for a headache. How do you use Peppermint Leaf? Let us know in the comments below! The easiest and most time-honored way to use herbs is as a beverage. We usually call this liquid an ​herbal tea​. What we drink and refer to as tea is usually actually a weak ​infusion. ​Herbal infusions are​ made by covering the leafy or floral portions of the plant with freshly boiled water, using a cup of water to 1-2 teaspoons of herb. The mixture is allowed to steep for 3-5 minutes before straining out the herbs and using the liquid. ​A stronger preparation, called a ​decoction​, is made by simmering larger amounts of the herb in water over low heat for 15 minutes or more. Decoctions are usually made from the dense, woody parts of the plant. Using 2 teaspoons of herb (or more) per cup of water and simmering it until the liquid reduces by half allows the active constituents of the herb to concentrate into a more potent form than a lightly-steeped infusion. Hot infusions made from richly-scented herbs should be covered while steeping to keep the volatile oils from dissipating into the steam. (Simply cover the pot or kettle while steeping, or if making only one serving, place a small saucer over the teacup.) Decoctions are generally used for medicinal remedies such as compresses, enemas, or concentrated herbal syrups. Infusions and decoctions should always be made with the freshest, purest water available. They’re best when fresh, but can be refrigerated and used within a maximum of 3 days. 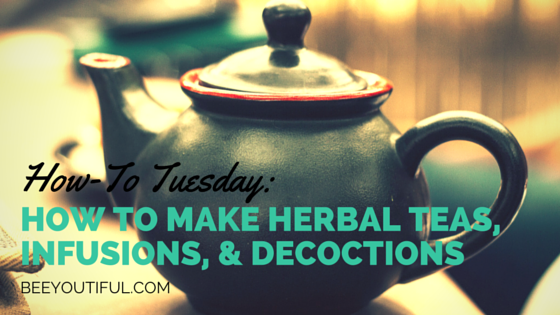 Both infusions and decoctions can be made using a single herb or a combination. Some blends are formulated to take advantage of the synergistic support of the selected herbs, or to allow a sweeter herb to disguise the strong flavor of a nourishing but less pleasant-tasting herb. After weeks of behind the scenes mixing, blending, researching, tweaking, tasting, and even more mixing, our Beeyoutiful product development team is finally ready to proudly introduce a line of custom formulated herbal teas! These are the teas we reach for with our families, no matter what is going on in our lives. These delicious blends have been formulated to provide nutrition to support your body through its changing needs, and we went out of our way to make some easy button options for you. Keep your eyes open in the coming weeks for even more blends that will be added! Bee Ready Mama – When you are growing a new life, your own body needs access to a much larger amount of nutrients, the building blocks of life. Eating a well-balanced diet full of traditional foods as described in the Weston A. Price Guidelines helps ensure that the maximum amount of needed nutrition is available to the mother’s body to create the new life within. Adding a tea such as Bee Ready Mama can aid in achieving the optimal nutrient level. This specific blend was formulated to support with nutrients that both nourish the body and help to support the reproductive system. With the deliciousness of tart rosehips dancing on your tastebuds along with a subtle hint of lemon, all the herbs mingle to create a nourishing and refreshing tea that is as pleasant to drink as it is beneficial. Since every woman and every pregnancy is unique, be sure to have your pregnancy care provider review the ingredients to be sure they are appropriate for you. Catch-A-Dream – On those long nights when sleep has not found us, we turn to a warm mug of Catch-A-Dream Tea. It’s formulated with a special blend of five herbs to support and nourish our bodies while encouraging deep and restful sleep. Effective and gentle enough for our littlest ones (2 and up! ), Catch-A-Dream’s soothing mint aroma will help lull you to sleep. Herbal Immuni-Tea – When the sniffles sneak up or your system is run down, it is time to pour yourself a glass of Herbal Immuni-Tea. With herbs carefully selected to support the body when exposed to or fighting off viruses, Herbal Immuni-Tea is a delicious tea that is sure to please your pickiest sipper. And while it’s not for sipping, Beeyoutiful’s Madre Mender Postpartum Sitz Bath is a great way to support the healing process for uncomfortable, swollen, or damaged tissue after giving birth. With a healing and vibrant mixture of herbs, Madre Mender provides a soothing and beautiful bath mixture. Each herb was hand selected not just for its healing properties, but to bring some of the most beautiful parts of nature to your bath. We cannot wait to hear your response to these new teas! As you are learning how to use herbs in your own home, this is a great way to incorporate them into your daily routine. These herbal teas are a great value, too; just one pound of loose herbal tea makes approximately 200 servings, making it one of the most affordable ways to incorporate the benefits of herbs into your health-building strategy. For even more about using herbal infusions and decoctions, we suggest Herbal Antibiotics and The ABC Herbal.